Peter Hitchens, in his column for The Mail, described refugees coming to Britain in terms of an invasion from which we need to protect our country. If we let them in, he wrote, it would be tantamount to giving the country away to “complete strangers” only because “it makes us feel good about ourselves”. Mr Hitchens wouldn’t put into print what the thought they really were. “I am too afraid of the Thought Police to use what I think is the correct word,” he wrote. 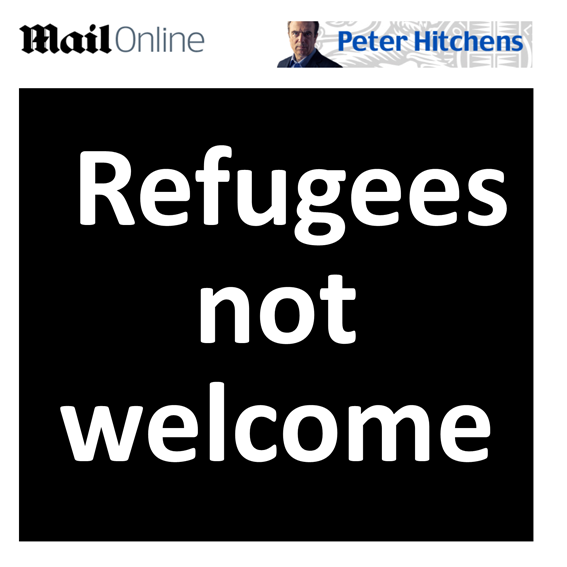 If not, claimed Mr Hitchens, then all those do-gooders are doing is expecting others to pay for refugees here so that they can experience “a self-righteous glow”. In his column titled, 'We won't save refugees by destroying our own country', Mr Hitchens conceded that, yes, "stupid” interventions by this country in Iraq, Libya and Syria have turned “many innocent people into refugees or corpses”. On the basis of Mr Hitchens alarmist fears of invasion, I wouldn’t be surprised if volunteers now come forward not to warmly greet refugees as they did in Germany this week, but to fight them on the beaches, stopping them from entering our precious isles. But Mr Hitchens column gave a one-sided, slanted view of refugees only as undesirable, thuggish-looking forceful young men. Yes, we’ve seen some on our TV screens seemingly to be on a bit of a rampage, demanding rather than needy. However, this isn’t a rounded or fair view, is it? There are thousands of tearful, profoundly scared children, homeless and lost, many of them orphaned, who are refugees; thousands of women who have lost their husbands, their homes, who are exhausted, stateless and yes, desperate. There are also men who are injured, seriously injured and scarred, both physically and mentally, from war and horrific torture, who are not shouting, running, demanding, but quietly sobbing inside, forlorn, broken, their spirits crumpled. To suggest that allowing refugees into this country represents an invasion is a distortion of the real situation. All such articles do is to fill our citizens with fear against helping anyone who is not of our island. If we believe Mr Hitchens, refugees coming here potentially represents a mortal risk not just to our future, but to the future of Great Britain as an independent nation. Frankly, in my view, this is quite ridiculous. Mr Hitchens doesn’t acknowledge the categories of refugees I have described above; nor does he quantify the precise numbers coming here that he considers would represent a true invasion. He just mentions his generalised fears of refugees being allowed to come here, and how we have to protect our country at all costs. In my view, his article promotes not wisdom and good advice, but a generalised fear of foreigners. In his column, Mr Hitchens claimed that “mass immigration” to the UK means that British people have to adapt to the immigrants, “when they should be adapting to us”. Really? The majority of British-born people here - 88% - having to adapt to a small minority of just 12% who were born abroad, many of them considered to be British anyway (such as Boris Johnson and Joanna Lumley)? Most migrants here are law-abiding, hard-working, tax-paying, up-standing good citizens. Is it right to cast aspersions against all of them? Similarly, Mr Hitchen’s view of refugees is prejudicial, only presenting them in his column as undesirable-looking young men who he fears want to take over the country. However, refugees genuinely seeking asylum here are the victims of invasion and attack by terrorists; they have no desire, intention, means, or bodily strength to mount an attack on us. They are in the main vulnerable damaged people who have lost everything, who need help, and who need to be treated with dignity and respect. The government is planning to offer refuge to 4,000 Syrian refugees for settlement each year into this country over the next 4-5 years (and only, it seems, because of one photo that prompted this sudden U-turn). I don’t think this is nearly enough, but does Mr Hitchens really think that giving asylum to such small numbers of people represents any sort of invasion of our country? Or that these refugees will change the demographics of our nation? Mr Hitchens claims that all those calling for asylum seekers to be offered refuge here should be prepared to take them into their own homes indefinitely, and to pay for their food, education and medical care. There are in fact many people in this country prepared to welcome refugees into their homes. But that isn’t the point. On the basis of Mr Hitchens logic, we shouldn’t campaign for our government to do anything; we should always be prepared to do it ourselves. Want more hospitals? Go and build them, don’t expect the government to do it. Think the country needs more schools? So, go and set them up. Think our unemployed should be given more help? So, you do it. Think the country should help refugees? Well, you go and help them then. Using this rationale, there’s nothing left for our government to do. The fact is, however, that we pay our government; they use our money. Why shouldn’t people speak up on how they feel our government should be using our money? Our government, in our name, is currently spending many millions of pounds of our money dropping bombs on Iraq, which probably kill far more innocent civilians than they kill terrorist soldiers. Now our government wants to use more millions of our money dropping bombs on Syria too, which will undoubtedly help to create yet more refugees, who we don’t want to help. None of this alone will help to resolve the issues in these regions; they just delay the progress of terrorist armies, rather than stopping them for good. It was our government that spent billions of pounds of our money originally bombing parts of Iraq, Syria and Libya back to the Stone Age, helping to create the circumstances for what is now the world’s worst ever refugee crisis. In our name, our successive political masters have contributed to how the world has now turned out. How can we simply wash our hands of that fact? Furthermore, Mr Hitchens makes no mention of previous flows (he’d no doubt call them ‘invasions’) of people coming to our country. Would Mr Hitchens have turned away the 40,000 Ugandan Asians who were allowed refuge in this country when Idi Amin kicked them out in 1972? In similar terms to how Mr Hitchens now writes, many people strongly objected then to those Ugandan Asians coming here. But they came, and they didn’t conquer. Instead, those refugees integrated well into our society (contrary to the alarmist warnings of those who claimed that couldn’t happen) and they turned out to be very clever, entrepreneurial people who helped to enrich our communities and to make our country richer. So, based on Mr Hitchens logic, would he have closed the door on those Ugandan Asian refugees, or does he only want to close the door on the world’s current refugees, just because he’s seen some young men on the telly that he doesn’t like the look of? Yes, I do agree we have to be careful; we don’t want any terrorists coming here in the guise of a refugee. That will require clever monitoring by our security services, and the country and its citizens have a right to expect that everything will be done that can be done to protect us. But all genuine refugees are the victims of war, oppression and terrorism; they are not the perpetrators. We need to find ways to give refuge to a fair quota of them, not only because it’s the right, humanitarian thing to do, but because it’s in our self-interests. We can’t let millions of stateless broken people wander the world, or end up in stasis in squalid hopeless refugee camps for years on end, without this issue having the potential to engulf the entire planet into turmoil, including us. In the long term, this world crisis will not disappear by us just turning our backs and hermetically sealing our borders. Mr Hitchens didn’t offer any recommendations on how a leading country such as Britain could contribute to calming down and resolving the world’s worst refugee crisis (although, to be fair, he may have offered such advice in previous columns – I’m not a regular reader). Mr Hitchens might agree with me, however, that the ultimate goal should be to help to bring peace and stability back to those countries and regions now torn apart by war, violence and oppression. Then millions of refugees could go to where most of them really want to go: not here, but back home. • VITAL VIEWING: The best video summary I have seen so far explaining the refugee crisis. Look and learn. Do you take pleasure in making yourself look an absolute fool? Hitchens argued that a an entire continent is having its civilisation destroyed, and all you had was 'oh, what a xenophobe'. Hitchens loves foreigners; he wants to preserve the culture of millions of them, as his article states "an unstoppable demographic revolution in which Europe (including, alas, our islands) merges its culture and its economy with North Africa and the Middle East. If we let this happen, Europe would lose almost all the things that make others want to live there.” People like you are complicit in all this.You are also complicit in the deaths of thousands of immigrants who see your comments and think the UK is welcoming anyone who can reach Europe's shores. They die trying to achieve that and YOU are to blame. We live in a country where we have free speech; I expressed my point of view. I don’t want there to be a world-wide refugee crisis, let alone any refugees dying. My recent articles have made clear that Britain appears NOT to want to accept refugees here; Britain has rejected requests to join EU and UN initiatives to fairly distribute quotas across the EU of the thousands of refugees now reaching Europe. I fail to see how my articles could have given any refugees the idea that there is a big WELCOME sign by the British government – not that I imagine many of them have access to my blog whilst attempting the perilous journeys to reach Europe. Your accusation that I am to blame for the deaths thousands of refugees is unfounded and misplaced. I want refugees to be rescued from their plight. "My recent articles have made clear that Britain appears NOT to want to accept refugees here" And you argued against that stance. You wrote "And the government is turning its back on the world’s worst refugee crisis; showing itself to be deaf to the frantic howls of refugees clinging to the forlorn hope that we might help; showing itself to be blind to the images of dead children who can scream no longer as they are lifelessly washed ashore." You cannot be angry at the government whilst supporting its desire to keep the numbers coming to the UK down. It's not reasonable. " I fail to see how my articles could have given any refugees the idea that there is a big WELCOME sign by the British government " I ddin't say that the UK government was issuing 'welcome' signs. I was referring to you and others who are posting their support for refugees coming to the UK. You haven't said a single sentence in support of the defence of the UK's culture, you attack people as being 'racist' when they are saying nothing of the sort, and you are completely unaware of the access to the internet that these migrants have as they break illegally into countries that they have no right to enter. " I want refugees to be rescued from their plight." Rescued how? Letting them into countries where their culture is unwelcome, unwanted and totally at odds with? I am proud to be British and support our culture, which I feel is robust and not under threat. You think that our culture will be damaged by some thousands of refugees being accepted here? Why do you think our culture is so so vulnerable? An important part of our culture is to help others in need, and to be a beacon of hope and leadership to the rest of the world. That part of our British culture I am proud of and want to retain. Was the British culture damaged by the 40,000 Ugandan Asian refugees who were allowed into our country in the early 1970s? Was the British culture hurt by the 10,000 mostly Jewish children refugees who were allowed to come to this country on the Kindertransport trains in 1939? No; our culture was enhanced, and our reputation and values were more greatly respected and admired across the world. If you're wanting to promote a British culture of racism, exclusion, hate and insularity, then count me out. It's that type of attitude that can do the real damage to our country. Instead, we should be showing maturity and leadership, and offering our bit to help our international allies to try and resolve what is a terrible disaster now facing the planet. Hitchens appears to have forgotten that our nation has a proud 250-year history of invading other countries, imposing a British regime on them and materially changing their national character. Seems he wants the right to dish it out without having to take it. I'm afraid it doesn't work like that, Mr Hitchen. We reap what we sow. We exploit poor countries; we generate economic migrants. We launch an illegal, immoral war; we generate refugees. We don't then have the moral right to wash our hands of the problem we have created and imposed on the world. On what moral basis should the people of 21st century Britain be punished for the actions of a relative handful of their forefathers? Britain didn't start the Syrian conflict, nor even the Libyan one. Both arose as a feeling from within those countries that they didn't want to be oppressed any further by their own people. The subsequent mess in both shows that these people really aren't suited to living in decent peaceful countries, and they should prevented at all costs from entering Europe. If you have a better source than the United Nations do please let me know. The UN says that over 60% of refugees reaching Europe this year were from Syria, Eritrea and Afghanistan, countries torn apart by war, dictatorial oppression and religious extremism. They are almost always accepted as genuine refugees when arriving in Europe. But they aren't refugees if they are leaving safe countries. They are economic migrants, and must have their applications to enter other countries processed under the law. Hi Anonymous, is there a reason you cannot post under your real name? Refugees are not economic migrants, there are important differences. Economic migrants voluntarily leave their homes, and they can return at any time. Refugees are forced out of their homes and their countries and cannot return. The first consideration is to find a place of safety, but after that refugees who have no possibility to return to their home countries will have to find a way of starting their lives again. Millions of refugees are stuck often for years in overcrowded, filthy camps, with insufficient food, water, washing facilities. It's no place to start life again. In Turkey 2.5 million Syrian refugees have a rough time with many forced to live on the streets. Many are not permitted to leave because the authorities will not give them exit visas - as was the case with the Kurdi family. There is no law or convention that says refugees must apply for asylum in the first safe country they reach, but there is an EU wide law putting responsibility on countries to properly process asylum seekers when they first arrive. But that isn't happening is it? Many countries don't want them. We apparently don't really want them. I think unless one has been a refugee or has been close to one, it's very difficult for many people to truly understand the great difficulties that refugees face just to survive, and then the problems of how to start life again. If you were a refugee you might find a place of safety but after several years of getting nowhere, you might well want to try your hardest to find a place you could truly start again. Most refugees, as I mention in my article, would actually like to go where most of us want to be - home. The camps may be unpleasant, but the refugees themselves are voting with their feet. Would they rather be in a tent in Lebanon or in Homs? "Refugees are not economic migrants" They become economic migrants as soon as they leave that safe country and enter another. They are shopping for the best deal. As I have stated before, there is a huge difference between refugees and economic migrants. Economic migrants voluntarily leave their country to find a better life somewhere else, and they can volunteer to go back home at any time. Refugees have no such choice; they have had to leave their home countries and cannot return. Finding a safe place is the first goal for anyone fleeing war, terror and violence. But then what? Then the task is to build a new life somewhere. That most certainly cannot happen in a camp, where many refugees are stuck for years. The vast majority of refugees - many tens of millions - are not coming to Europe. Most of them are seeing their lives waste away whilst they exist in stasis, with no chance of returning home, and with no future prospects. In those circumstances if I were a refugee, I would certainly want to do the best for myself and my family by finding not just a safe country, but a country where we could start our lives again. There is actually a much bigger problem than the 60 million displaced people and refugees in the world today; the bigger problem is the many tens of millions who didn't manage to escape. Finally, please note that all opinions are welcome on my blog here, even those that completely oppose mine (with the exception of any comments that promote or support racism or prejudice against anyone simply because of their race, nationality, religion or sexual orientation, etc; and any postings that personally attack or defame other posters). However, I am from now on making it a rule that only those who have the courtesy and courage to post under their real and verifiable names will be welcome. From now. comments by anonymous posters will not be accepted. Hitchens should look at the bombed out images of Damascus. He is removed from reality. Why are you hiding your name? Too ashamed to show your stupidity? Syria is at war! From both sides. Daesh and Assad! Please note that all opinions are welcome on my blog here, even those that completely oppose mine (with the exception of any comments that promote or support racism or prejudice against anyone simply because of their race, nationality, religion or sexual orientation, etc; and any postings that personally attack other posters or which are defamatory). Just to test the water, how will you be verifying someone's identity? What access do you have to their private information, and how how did you obtain that access? Surely who writes a post is of no importance when it is their comments you'll be addressing? It is possible to verify people's names, and where there is doubt, questions can be asked. This is not a private exchange but public, and people should take responsibility for their postings on a public forum. Many newspapers are now taking this line, especially when it's actually those newspapers who end up being legally responsible for, say, defamatory postings. I would turn the question around: if you believe in what you say, why not have the courage to proudly post under your real name, rather than hiding behind anonymity? (I'll expect a named response from you, should you want to reply).